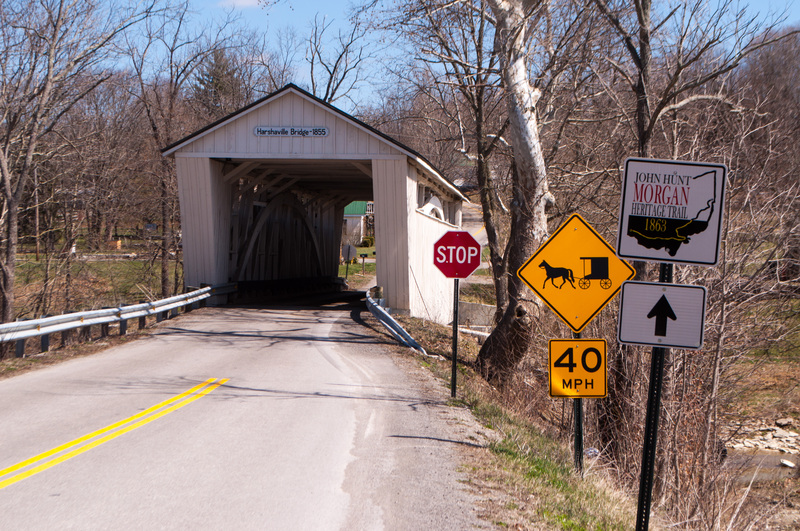 First up was the North Pole Bridge in Ripley, Ohio. Built in 1865, it used to be one of a pair, but its twin washed away in a 1997 flood. It is one of the longest remaining spans in the state. Google Maps said the fastest way to get to our first destination was by taking SR-32, but speed wasn’t on the agenda this day. We opted to take US-52 East because of the great views of the Ohio River and opportunities to pass through quaint towns like New Richmond with the world’s only Cardboard Boat Racing Museum. They also have a nice riverwalk and row of locally-owned shops along the river. 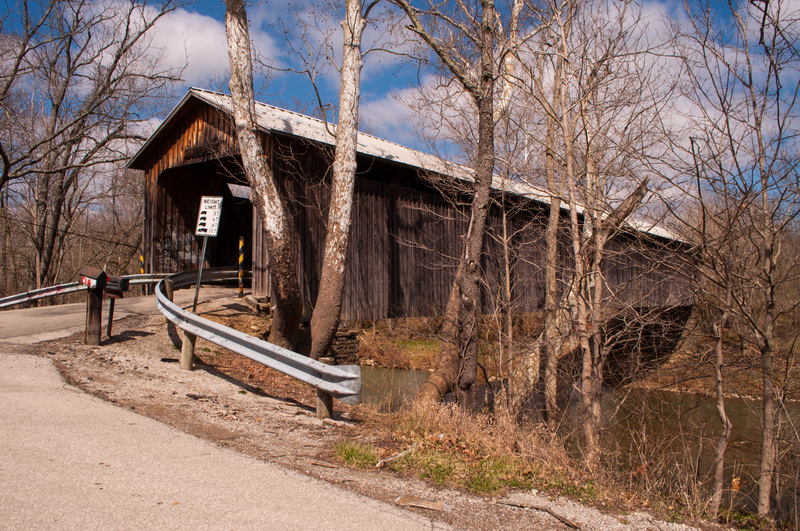 Our first stop was the North Pole Covered Bridge, just north of Ripley, Ohio, a great, old river town full of history. It is a famous stop on the Underground Railroad and part of Harriet Beecher Stowe’s “Uncle Tom’s Cabin” is based on events that happened in Ripley. It’s worth checking out the John Rankin House just for the views of Ripley and the Ohio River from atop the ridge. To get to the North Pole Covered Bridge, turn left onto US-68 and follow that for about 1.3 miles and then take a right onto North Pole Road follow that until you reach the bridge, about 3 miles. North Pole Road is a beautiful drive through some rugged hills. I couldn’t resist sticking the GoPro to the dash and recording the drive. North Pole Bridge crosses Eagle Creek and is still open to car traffic. Originally built in 1865, it underwent significant repairs after a damaging flood in 1997. It had a twin a little ways down the creek on SR-763, but that was washed away in the same flooding that damaged this bridge. At 166 feet long, the span is one of the longest remaining. 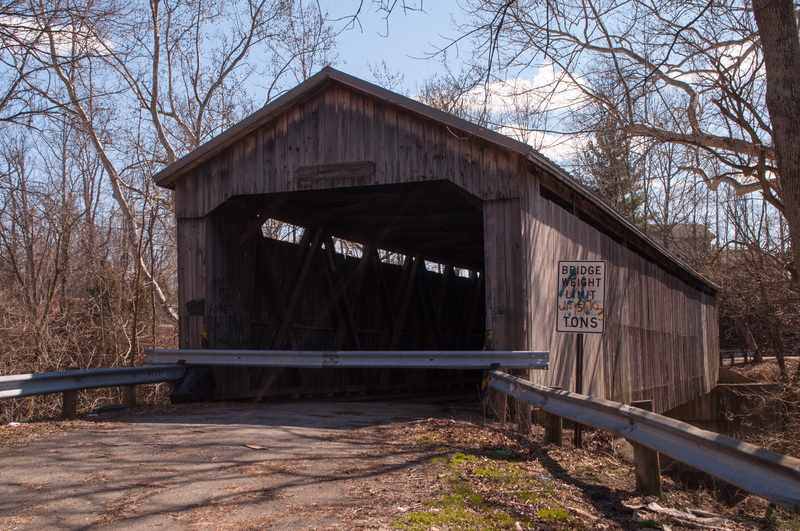 The second bridge on the list: George Miller Bridge near Ripley, Ohio. The 160 foot span crosses the West Fork of Eagle Creek. It was constructed in 1879. To get to the next covered bridge, head back down North Pole Road to US-68 and take a right to continue heading north. You’ll follow US-68 about 3 miles and turn right to US-62/68. Follow that about seven miles and then make a right onto George Miller Road. This bridge is also open to traffic, but there was some pretty significant wash out under part of one of the bridge supports, so I’m kinda wondering about this one. 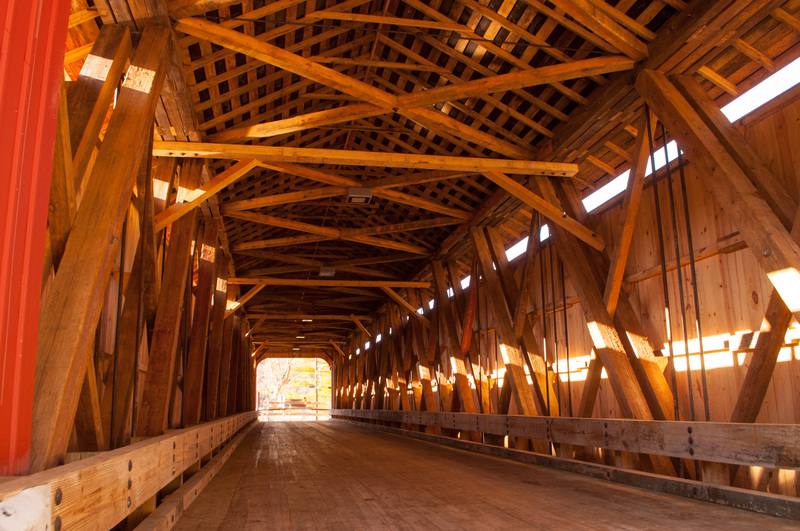 It was constructed in 1879 and renovated in the 1990s by an Amish construction company. Next up, bridge #3: Harshaville. This bridge was one of the few in the area to escape the torch during a Civil War Raid. It was built in 1855 and is 110 feet long. So finding this one got a little bit interesting. First of all, I left my phone – with the map saved on it – at home when we left. (I’m super organized.) Granted, the map is saved in My Maps in Google, but I was never able to get the directions loaded quite the same way on anyone else’s devices. Plus, I’m terrible navigator. There is no future for me as a career right-seater. Nevertheless, we headed back out until we came to a crossroads. I thought my directions were telling us to turn left but Mom thought it was right. Turned out, it was left and when Mom realized where we were headed she knew how to get there without the map. Apparently, I’ve been to this bridge before, I just don’t remember it. 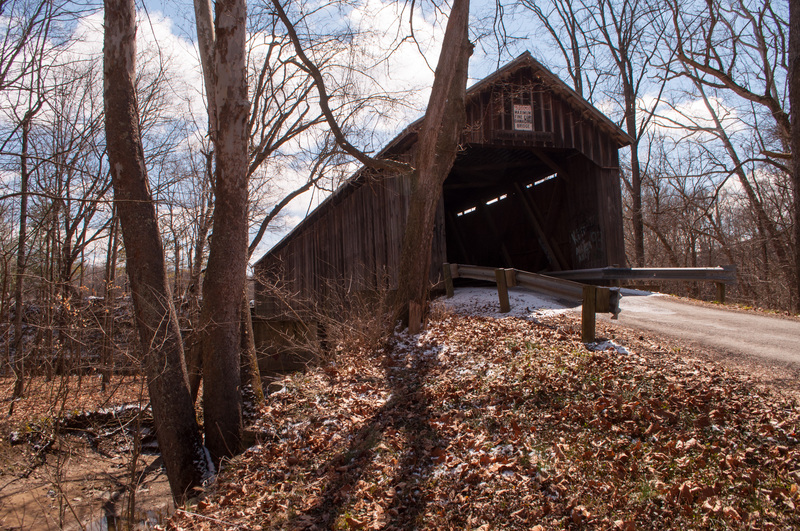 Nestled near Amish country, the Harshaville Covered Bridge has some interesting history. It was one of the few bridges in the area to survive sacking and burning during Morgan’s Raid in the Civil War. This raid amounted basically to a terror attack of Confederate forces coming north to do little more than cause fear and destroy infrastructure. It also served to distract some Union forces and draw resources away from other areas. 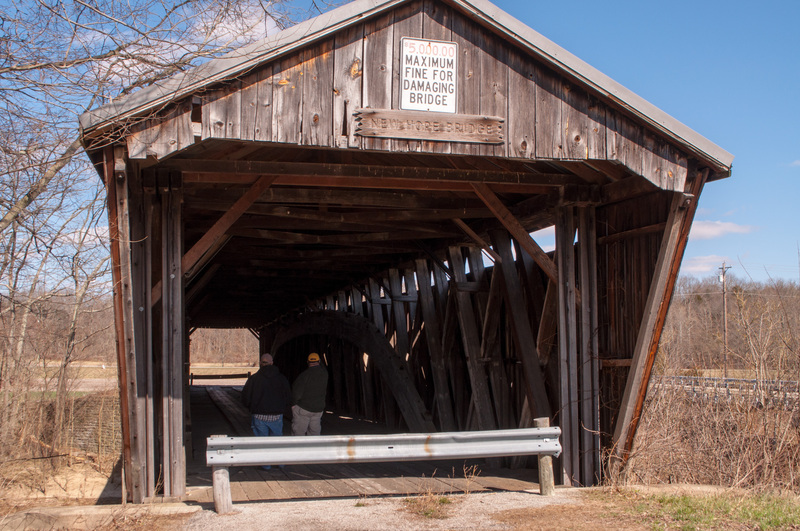 Built in 1865, it is the last standing covered bridge in Adams County. From George Miller Bridge you will keep heading southeast on George Miller Road until you reach SR-125. Make a right onto SR-125 and then a left to stay on it. Less than a mile later, make a left onto Eagle Street and then continue to Decatur Pike. Follow this for a little over four miles and don’t worry when you see signs for Graces Run Road. You will cross it at least once before you actually turn onto it. Keep following the bends of Decatur until you reach SR-136. Turn left to get on SR-136 N, then take a quick right onto SR-137. After about three miles, make a right onto Graces Run Road and the bridge will be along in about two miles. Brown Bridge was fourth on the list. This one is closed to automobile traffic, but you can still walk across the span. It was built in 1880 and is 129 feet long. We took a bit of a side trip after Harshaville. It is close Amish Country off SR-32 so we paid a visit to the Millers. After taking some refreshment and picking up some baked goods for the road, we set off for Brown Bridge, where old TVs go to die. When we visited this bridge there were three or four old, big box TVs that look like they’d been tossed over the guard rail into the woods below. I suppose that was as good a place as any to dump them? Nevertheless, it was still a pretty spot. Brown Bridge was the fourth on our list. This was the first one we hit that was closed to car traffic. The entrance was blocked by a guard rail, but since I regularly like to take my life in my hands, I decided walking across was a great idea. (It wasn’t near as wobbly as other bridges I’ve been on before.) I love looking at all the names and dates carved into the bridges and this one had some that looked legitimately as if someone had carved them in the 1970s and not last week and pretended it was 1972. From the Harshaville Bridge head west on Graces Run Road toward SR-247. In about a mile, turn right onto SR-247 and follow that for about a mile and a half. When you reach SR-32, take a left and follow that for about 18 and a half miles. Take a left onto Klein Road and continue onto New Hope-White Oak Station Road. After two miles, take a sharp right onto Beckelheimer Road. The bridge will be just ahead. Bridge #5 was my favorite: Bethel-New Hope Bridge. This one had the most interesting construction, at least to me. 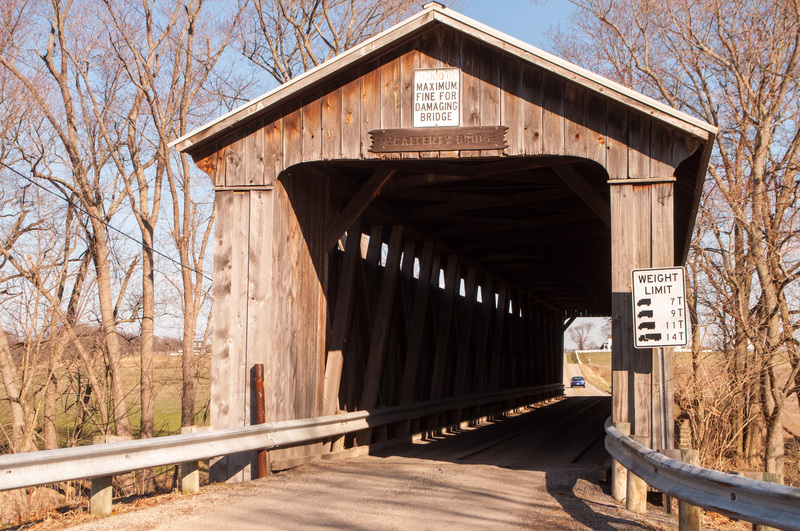 It was built in 1878 and at 172 feet long, it is the longest single span covered bridge in Ohio. This bridge had the coolest structure of any of the bridges in this tour. I’ll admit, I don’t know much about bridge construction. I can’t tell the difference between a Burr and a kingpost, but this one seemed super fancy to me. Instead of there just being the wooden braces in the walls, it also has arches on either side of the bridge that connect it to the abutments and metal rods that help hold the bridge together. The span is 172 feet and is the longest single span in Ohio. It was built in 1878 and bypassed 100 years later, in 1978. Today, it appears as if it is sitting on private property, but the old road passes in front of the house; the bridge is still public property. It is closed to vehicle traffic, but still seems to be in fairly good shape, even if I didn’t feel safe walking along the single layer of boards down the middle of the bridge. The wood just didn’t feel that sturdy. I went about halfway down the center of the bridge and then decided to stick with one of the reinforced spots where tires used to tread. From Brown Bridge, head back to New Hope-White Oak Station Road and make a left. Take a sharp left onto Oakland Road and then another left onto US-68 in about two miles. After about three miles, take a right onto Bethel-New Hope Road. The bridge will be about 500 feet ahead. We hit McCafferty Bridge sixth. It was quite a busy one-lane bridge. It was built in 1877 and is 160 feet long. We hit our sixth bridge after stopping for some dinner. We’d been out exploring for five hours or so and were famished. There’s a restaurant off US-68 called Lake Manor that we usually stop at once a year for breakfast when we are going to cut down our Christmas tree at Corsi Tree Farm, and we decided to stop at Lake Manor for dinner before finishing up with the last two bridges. McCafferty was a pretty busy little bridge. I say “little” but it’s about 157 feet long. It was built in 1877 and still seems to be in great condition. From Bethel-New Hope Bridge, head east on Bethel-New Hope Road and get back to US-68. Take a left onto US-68 and follow it for about 10 miles. Turn left onto SR-286 and follow for about five miles. Make a right onto US-50 and then another quick right onto McCafferty Road. Stonelick Bridge was the last on our list. This is a reconstruction of the original span built in 1878. It is 140 feet long. It reopened to traffic in April 2015. The last bridge wasn’t even on my list and I had no idea how to get there. Dad got us there from memory of years of traversing Clermont and Brown Counties. I didn’t put Stonelick Bridge on the list because I knew it had fallen in after some idiot disregarded the posted load limit and ran across the bridge anyway, damaging the structure. That was in 2010. The bridge held up until February 2014 when it collapsed while being repaired. Turns out, the bridge has been reconstructed and reopened April 15. Now, I wonder if the new bridge will be haunted the same as the old one? To find Stonelick Bridge, get back to US-50 and head West. Continue through Owensville and turn right when you find Stonelick Williams Corner Road. Follow that through the woods until you reach the big, red bridge. This entry was posted in Adventures, Covered Bridges, Day Trips, History, Ohio, Road Trip and tagged Adams County, architecture, Bethel New-Hope Covered Bridge, Brown County, Brown Covered Bridge, Clermont County, Covered Bridges, day trips, driving, George Miler Covered Bridge, Harshavile Covered Bridge, History, McCafferty Covered Bridge, North Pole Covered Bridge, ohio, Stonelick Covered Bridge, travel by Cassie. Bookmark the permalink. This morning, May 20th, 2017, my girlfriend and I spontaneously thought of traveling to see covered bridges in Ohio. We live near the Stonelick Bridge but have heard there are many more to cross. After looking on the internet for a map we quickly found your story and travel guide. Thank you for the information, we found it very useful and had alot of fun. We started at the North Pole Bridge and followed your route as described and it worked out very well for us. Thank you!!! Hello Tracy and Ryan! I’m absolutely delighted you found the information useful. I had so much fun driving around that day! Happy adventuring! !